The second Vedanga is Kalpa (ritual) which is called the arms of the Veda Purusha. It is especially intended for the proper application of the Vedic texts. The oldest Kalpasutras are those which in their contents are directly connected with the Brahmanas and Aranyakas. It was the ritual (Kalpa), the chief contents of the Brahmanas, which first received systematic treatment in the manuals called the Kalpasutras. They contain the rules in the Sutra style, referring to sacrifices, with the omission of all things which are not immediately connected with the ceremonial. They are more practical than the Brahmanas which for the most part are taken up with mystical, historical, mythological, etymological and theological discussions. 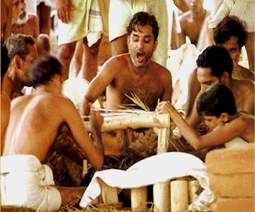 They are also considered significant for the study of Vedic culture and society. There are four types of the Kalpasutras:(1) Shrauta-sutras, dealing with Shrauta sacrifices(2) Grihya-sutras, dealing with the domestic ceremonies(3) Dharma-sutras, dealing with the religious and social laws(4) Shulba-sutras, dealing with the rules of measurement of the fire-altars etc.